There’s discussion over at Mig’s Daily Dirt about a Bobby Fischer movie and who should star as the man. Tobey Maguire not well received there; Josh Lucas and Ryan Gosling both put forward as better suggestions for looks and/or ability. More interesting: What would be the WORST choice for playing Bobby? Remember, Bobby was tall, intense, moody, dashing, charming at times, and incipient-crazy. UPDATE: Matt wins, both for ingenuity and for exceptional photo editing skill. Clint Howard! ROFL…have to have Ron Howard on board as director then! I humbly submit one Danny Devito. Clint Howard wins the thread. I’m not even going to try to top that. Ooh, ooh, DJ Lance, in character! I think a fascinating choice might be Sacha Baron Cohen. HAHAHA!!! 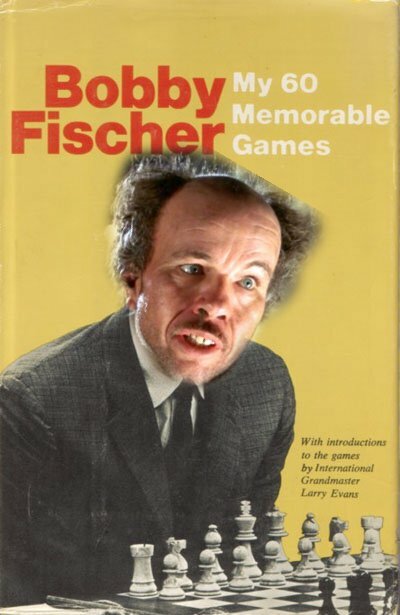 The Clint Howard “My 60 Memorable Games” cover is priceless! Sacha Baron Cohen…inspired! Yeah, I think so too. @regondi: You say that Clint Howard can act, but he was also in “Santa With Muscles” and “Leprechaun 2”. That’s the kind of thing that will haunt him forever. Egg – Santa with Muscles? Your knowledge of bad movies is truly impressive. R&R – Sacha Baron Cohen would certainly make it interesting. For that matter, who likes playing crazy more than Johnny Depp?